Featured in the film: Bill McKibben, Joanna Macy, Gus Speth, Roger Payne, & more! 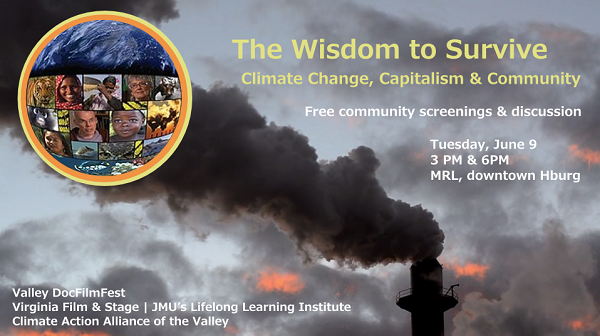 Please join the Climate Action Alliance of the Valley for two community showings of this film on Tuesday, June 9, 2015, at Harrisonburg’s downtown library, 174 S. Main St., at 3:00PM and 6:00PM. These screenings are part of “the 1st ever Valley DocFilmFest.” The film is just under an hour long. Please stay for a discussion about it after each screening.